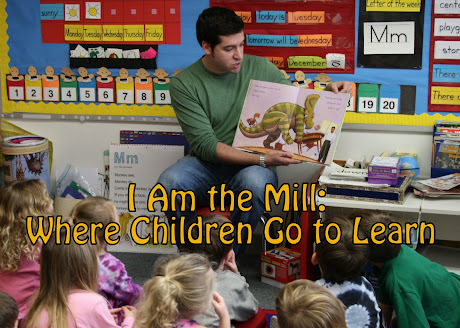 I Am The Mill: Are You Ready For Some Taxes? It’s baseball season. I should be solely focused on my fantasy team, and the National League East race. I should be looking forward to months of hot baseball action, as the boys of summer begin finding their grooves, and we’re able to separate the stars from the has-beens. The cream always rises to the top after a month or so. It’s a great time of year and one of my favorite seasons in the sporting calendar – second only to the early fall, when the NFL is gearing up for their grueling and exciting 17 weeks of violent fun. However, when I look at the calendar right now, there is one absolutely massive obstacle in the path to my personal enjoyment of, well, just about anything. I’m not talking about the Mets vs. Nationals game at Shea – although it promises to be a real barnburner. No, I’m talking about the deadline to file your taxes. Have you forgotten about it? If so, it’s pretty much time to start panicking. But I’m glad I reminded you. Normally, I’m way ahead of the curve with this. I loves me some refund checks from the IRS. Things are different this year, though. I’m not sure if it’s because I’m in a new tax bracket, or just don’t have as many deductions as I used to, but Uncle Sam will not be sending me much, if anything in the way of refunds this year. So there goes my motivation to gather my forms, fill out the worksheets, and fire up the TurboTax software. And thus, here I am, with the April 15th deadline screaming towards me like a Dice-K gyroball, and my taxes have yet to be filed. The pressure’s on. It’s the bottom of the ninth – and since there are still several days left before the 15th, I guess the proper analogy is that I only have one out. But I’m down by 7 runs, and I can’t find my 2007 W-2. Also, I’ve just received notice that my 2006 Form DTF-686-ATT (New York Reportable Disclosure Statement and Request For a Determination) is incomplete, and will need to be submitted again. I’m pretty sure I don’t know what the hell that is. Anyway, all this anxiety-inducing tax talk got me to thinking – it must be nice to be a pro ball player and have someone do your taxes for you. Also, it must be nice because I bet the deductions you can take are rather extensive when you’re always on the road, and your body is essentially your business. - Manny Ramirez’s Maserati: Non-reimbursed transportation and commuting expenses. Whatever keeps Manny happy and showing up for work is a legitimate deduction, according to Red Sox accountants. 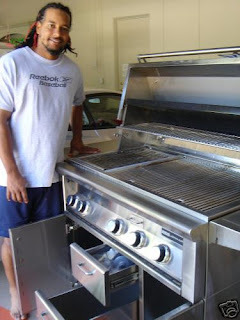 Manny claims a deduction for this awesome grill. He wheels it into his parking space when he drives to the ballpark - "Manny no like when space gone when he come home." Funny thing is, Manny has his own 4-car garage. - A-Rod’s $1200 designer sunglasses: Legitimate business expense, as the glasses protect him from sun and paparazzi camera flashes, preserving his eyesight so as to strike out only when his at-bats actually matter. - Prince Fielder’s aerobics class membership: The Brewers and the IRS understand that if Prince isn’t careful, his body could soon resemble that of his father’s. In other words, a cross between Jabba the Hut and a Butterball frozen turkey. - Derek Jeter’s scented hair crème and almond butter body lotion: Jeter’s business is as much about slick fielding and solid hitting as it is looking oh-so-fine for the ladies. It’s almost a no-brainer that the IRS would allow for this deduction. They’re probably in love with him as well. I just wish they'd admit it. Best of luck to you as you race against the IRS clock, and try to get your act together by the 15th. May your deductions be as plentiful as your frustrations and anxiety. Okay, I love the A-Rod comment. Haha..striking out only when it counts! Priceless Mill! Manny is a great hitter. He put on a clinic the other night versus the Yanks. But man, is that guy dumb.